With FireText you can send instant SMS text messages via your favourite email client. You can receive SMS messages into your inbox too. Simply compose an e-mail in the usual manner and send it to the FireText Email to SMS address. 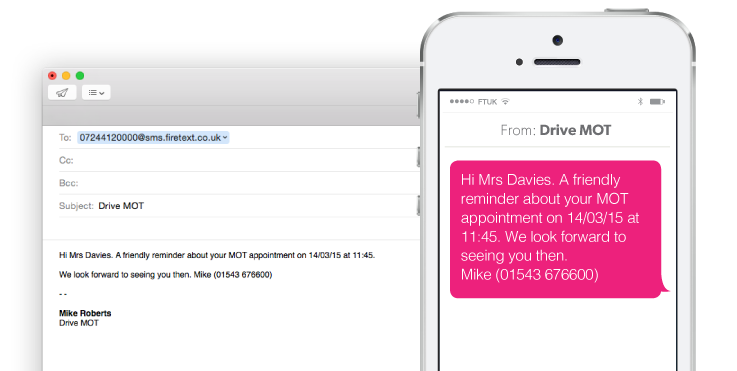 Instantly your email is converted and sent as a text message to your customer. They can even reply straight from their mobile to your E-mail inbox. You can control where your text message content ends by adding two hyphens (--). This stops you from sending your complete email trail or unwanted email signature. You can even copy-and-paste your contacts list instantly. When a customer replies, you can instantly forward the message to your email. This is perfect for continuing the conversation without leaving your favourite email client.